Esprit de la Mer is set on a dramatic cliff top and enjoys breathtaking views of the ocean and surrounding coastline. Mediterranean in style, the villa offers tasteful interiors that feature a mixture of tile, iron and warm woods. There is a spacious living room with formal dining area. Additionally, there is a fabulous gourmet kitchen that opens onto a terrace with oversized infinity styled pool and spectacular views of the ocean and nearby Baie Rouge Beach. 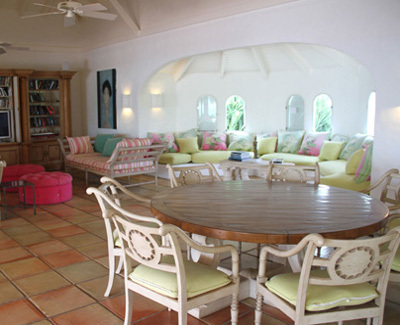 The villa has five beautifully furnished bedrooms and 5.5 bathrooms. The outdoor area includes a covered terrace and a gazebo complete with a wet bar and relaxed outdoor living and dining areas. There is also a gym. A path through the gardens leads to a cliff top gazebo, offering beautiful views to the turquoise ocean waters below. Esprit de la Mer is an ideal vacation property for couples or families alike.